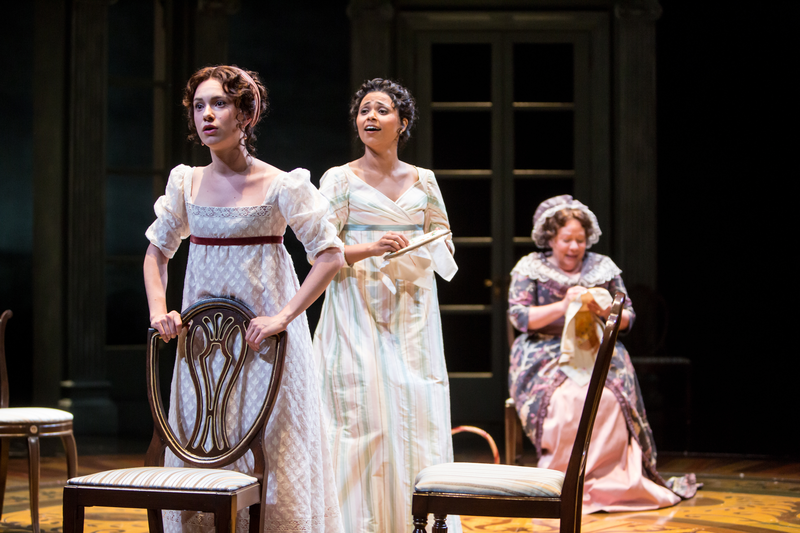 Alejandra Escalante (Marianne Dashwood), Jolly Abraham (Elinor Dashwood) and Suzanne Warmanen (Mrs. Dashwood) in the Guthrie Theater’s production of Sense and Sensibility, Photo by Dan Norman. I’m writing this review as an unabashed Jane Austen fan and addressing it to the likewise. Anyone else is a mystery to me and I wouldn’t know where to begin. Janeites/Austenites will love the Guthrie Theater and Kate Hamill’s reverent, yet lightly modernized adaptation of Sense and Sensibility. With spot-on lead performances, exceptional ensemble acting and clever staging, Sarah Rasmussen’s Guthrie directorial debut will delight and entertain. But what about the costumes? Gorgeous…if not a little more subdued than Guthrie’s 2013 Pride and Prejudice designs. Jolly Abraham as Elinor Dashwood and Alejandra Escalante as Marianne Dashwood represent “sense” and “sensibility” very well in their romantic encounters and were especially moving during their sisterly interactions, truly conveying their mutual devotion and admiration. Rasmussen and Kimiye Corwin (Movement Coach) deserve praise for the unexpected use of dynamic movement to add visual interest in several emotional scenes and Junghyun Georgia Lee (Set Designer) for the clever use of the minimalist rotating set design. Many of the supporting characters and actors, however, stole the show. Michael Hanna stood out in the Greek chorus of gossips and as Robert Ferrars. Aeysha Kinnunen’s portrayal of Anne Steele was quirky, clueless and very funny (mirroring her portrayal of Lydia Bennet in the aforementioned Pride and Prejudice). Sally Wingert was adorably meddlesome as Mrs. Jennings and Natalie Tran equally adorable as the precocious Margaret Dashwood. In case you haven’t read Sense and Sensibility or seen the spectacular Emma Thompson movie version, the story follows the Dashwood women as they struggle to find a place in a world after the death of the family patriarch. Authentic and intelligent, the daughters must navigate a world in which good matches, money and position count more than the content of their characters. While some may find the themes and social rituals old-fashioned, I believe the dilemmas and choices Austen’s heroines must make stand the test of time — they struggle to stay true to themselves with integrity; they remain fiercely loyal to family even through conflict; and they find humor and passion in everyday life. Sense and Sensibility, directed by Sarah Rasmussen. Adapted by Kate Hamill based on the novel by Jane Austen. September 10 – October 29, 2016 at the Guthrie Theater. Single tickets start $15 at the Guthrie Box Office at 612.377.2224, toll-free 877.44.STAGE, 612.225.6244 (Group Sales) and online at http://www.guthrietheater.org.